In the Moment is a program of art engagement for people with Alzheimer’s Disease and other forms of memory loss. We invite facilities that work with this population to bring groups to the museum. In the Moment offers interactive exhibit experiences at the Long Island Museum, a safe and welcoming environment in Stony Brook. In the Moment programs are offered in our Carriage and Art Museums. 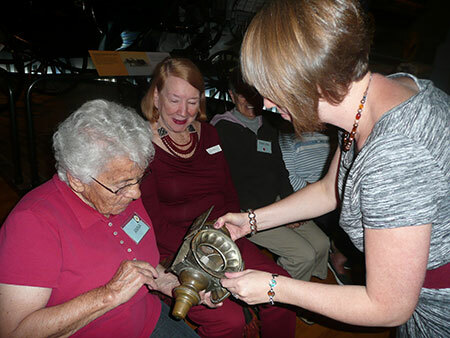 Museum educators lead the programs, which are designed to spark imagination and encourage lively discussion. Arts & Alzheimer’s Conference: Save the date for our 4th annual conference on Friday, April 5, 2019 ~ 9:15 a.m. – 3:15 p.m. Click the link for the full schedule. Programs are offered on Tuesday afternoons and are limited to small groups. Special arrangements may be made for individuals and their care givers. Sessions last for one hour and include refreshments and opportunity to socialize. Pre-registration is required. Contact the museum’s Education Department at (631) 751-0066 x212 for more information and to make arrangements. In the Moment is underwritten by a generous grant from The Knapp/Swezey Foundation and sponsored by Burner Law Group, P.C.